The Emergency siren/s should be located suitably to cover the whole area with the operational control within the installation. These should be tested at least once in a week to keep them in working condition. Emergency Level-I: A wailing siren for two minutes. Emergency Level-II and III: Same type of siren as in case of Level – I and II but the same will be sounded for three times at the interval of one minutes i.e. ( wailing siren 2min + gap 1 min + wailing siren 2min + gap 1min + wailing siren 2min) total duration of Disaster siren to be eight minutes. ALL CLEAR: Straight run siren for two minutes. Public address system should be provided with message. FIRE: For fire situation, the siren shall be wailing sound for 2 minutes. 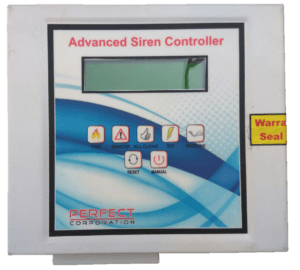 DISASTER: For disaster situation, the siren shall be wailing sound for 2 minutes repeated thrice with a gap of 10 seconds. ALL CLEAR: For all clear situation, the siren shall be straight run sound for 2 minutes. TEST SIREN: For testing, the siren shall be straight run sound for 2 minutes. We can also customize this as per customer requirements. has no impact outside the site, location or installation. is likely to be danger to life, the environment or to industrial assets or reputation. Level 3: This is an emergency or an incident with off-site impact which could be catastrophic and is likely to affect the population, property and environment inside and outside the installation, and management and control is done by district administration. Although the Level-III emergency falls under the purview of District Authority but till they step in, it should be responsibility of the unit to manage the emergency. Note: Level-I and Level-II shall normally be grouped as onsite emergency and Level-III as off-site emergency.